The newly released Ultralite model HFDL28 hand/foot system is the most effective and efficient hand-and-foot unit on the market. Because its output is 3 to 6 times that of of any competitor’s product, the treatment times are shorter and effective lamp life is 2 to 4 times greater. This will give the user significant cost and maintenance savings. 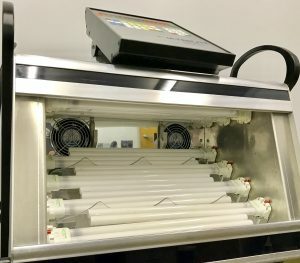 Usually the operating costs are so low compared to competing equipment that the savings in replacement lamps alone will more than pay for the unit itself. Moreover, anecdotal reports suggest that the Ultralite HFDL28NB (UVB narrowband) can clear patients previously thought unable to clear using phototherapy. This finding has prompted great interest in determining experimentally whether this is indeed the case. The new design of the Ultralite HFDL28 was developed from the highly successful HF 1200 series, in clinics and homes for nearly twenty years. The more compact design gives equivalent intensities using 14 lamps total for each section instead of the previous 12. This results in additional maintenance savings and lower operational costs. As always, the Ultralite hand-foot system irradiates both sides of the hands and feet simultaneously and controls the exposure with a precise dosimetry system. In addition, the revised structure allows easier routine servicing and the ability to use the same system for either UVA, UVB broadband, or UVB narrowband therapy. It is recommended that if more than one type of therapy is performed at a location on a regular basis, one system be dedicated to each. However, if the need arises to switch from one type of therapy to another, the steps required to make the changeover are minimal and require no additional parts. This changeover will not necessarily require a field service visit by an Ultralite technician. Each system is factory-assembled with an integral stand and casters to allow easy movement when required. The integral stand is far more rigid and sturdy than any other system and permits the complete unit to be positioned close to a wall or office furniture on any of three sides. The design eliminates the possibility of obstructing the cooling air flow path and minimizes floor space requirements. Patients of almost any body structure can be comfortably treated using a standard office chair with height adjustment. The HFDL28 Hand/Foot system incorporates many features from the previous design and includes additional features to make this product even more superior to any other competing product. The previous HF1200 system and the new HFDL28 system share a compact ergonomic design. Lamps are positioned above and below the hands and feet to irradiate all areas simultaneously. Configuration of the lamps and reflector are carefully placed to maximize and optimize exposure. The time-tested control system delivers treatments with true dosimeter control for precise and repeatable exposures. New structure provides a more compact design with superior rigidity and a more robust framework. The slight reconfiguration uses fewer lamps, lowering power consumption and reducing replacement lamp cost. Yet the output levels are much higher than the earlier model, resulting in shorter treatment times. Changes to the controller position provides visibility and ease of use by the operator. New integral handles ease movement and positioning of the unit. Wire grid hand supports and UV opaque screen are designed for ease of cleaning. The system is available in either Narrowband UVB or UVA. 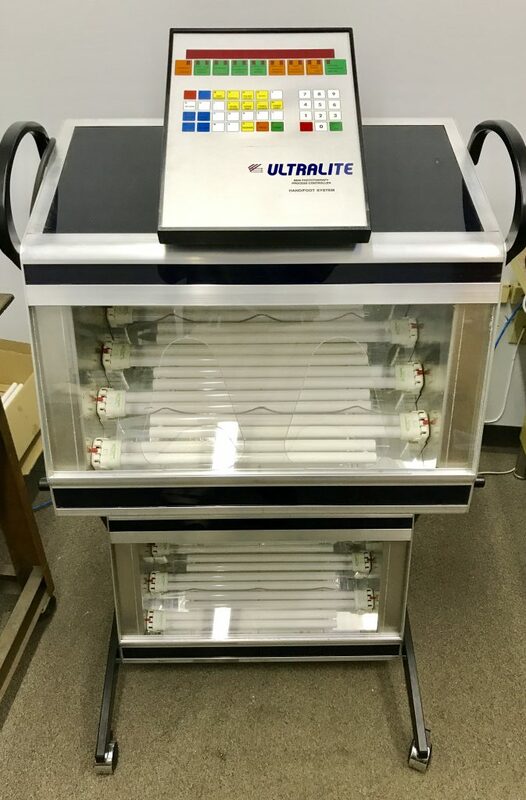 The function of the Ultralite system is to fulfill its purpose of delivering light treatments in a precisely controlled manner, using dosimetry rather than timer controls. This is achieved through a central processor unit that controls all the operating functions within the unit. The process controller allows the operator to select one or more methods of light treatment and to administer them easily and accurately. In addition, the process controller monitors the system’s operation, maintains data storage registers that allow it to indicate when predetermined or selected safety limits have been reached, and monitors the status of other variables. The user-programmable limits and status registers allow every system to be set up in a tailored fashion ideally suited to each individual physician. As circumstances change, the user can change the set-up data so that his or her unit is always suited to the particular circumstances. Twenty-eight narrowband UVB or UVA lamps are configured in a top and bottom bank array that allows the top and bottom of the feet and hands to be treated simultaneously. To penetrate thick palms and sole tissue, eight lamps in the lower bank concentrate energy where it is most needed while the six lamps in the top bank operate. Each bank of lamps can be controlled independently. A special solid-state electronic ballast powers each lamp. UVB intensities are initially 15-16 mW/cm2. The intensities remain stable after the initial burn-in period (about 15 hours).